You don’t get to change systems without shock. Adrian Botan studied architecture and design in Bucharest, wanting to get a job that was as rational as it is creative. Since fun was to be part of the equation, too, he wound up in advertising. It all started back in 1995 with a creative shop in Bucharest. Two years later, he switched to DMB&B, where he picked up his first international award, which was also the first of its kind for Romania as a whole. 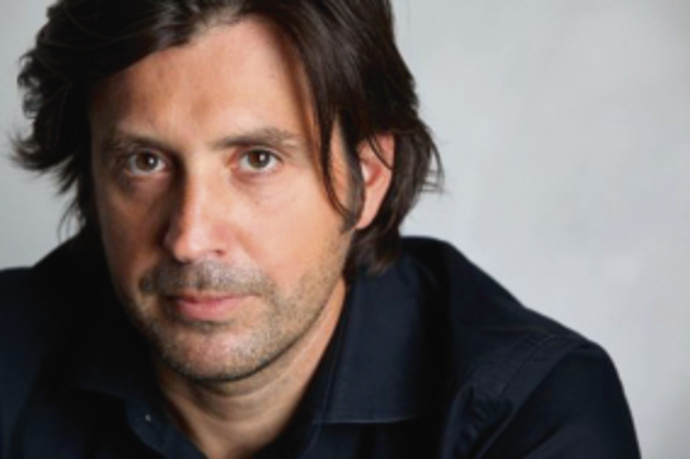 In 1998, Adrian joined McCann Erickson, where, to this very day, he is creative director. Under his creative leadership, the team has since won more than 150 awards, from the New York Festival through to Cannes, Epica, D&AD, and Eurobest. Furthermore, McCann has been named Agency of the Year six times and, in 2007, Botan led McCann into the Top 50 league of the Gunn Report of the most creative agencies worldwide. In 2011, McCann Romania scooped two Grand Prixs and a Titanium Lion in Cannes for the “American Rom” campaign. The following year, Botan added three more Lions. L.A.: How did you start out in advertising in Romania? Did you go to an art school or to university, or did you go straight into the business? Adrian Botan: I’m from Bucharest, and when I was in my high school years, it was during the communist times and there was a lot of pressure in the country to deliver engineers. So almost everybody became an engineer. And even though I wanted to be an architect, I started to train myself as an engineer. But then I gave that up and went on to become an architect, which is in the middle between engineering and art. It’s more of a whole-brain profession, because you have the artistic side but also you have to structure it and deliver functional benefits to your clients. You cannot just be a sculptor; you can make great sculptures but you also have to put something inside of that. So I think this helped me. But then, midway through school, I got into advertising. What attracted me to advertising was the social dimension that you have, that you work in a big team and you “socialize” ideas. And, for me, it‘s enormously important to be stimulated, to be surrounded by many people. Architecture, at least as it used to be in the Nineties, was a very lonely profession. L.A.: And then you went straight to McCann? Adrian Botan: No, I started by doing design, I was in a design shop – because architec-ture and design, they are close – and then I moved on to an advertising agency, a proper advertising agency, and it was D’Arcy DMB&B at the time. That was a great experience. And then I moved on to McCann. So I have been there for fourteen years now. And I am also partner in the Bucharest office. Additionally, I run the SEE region for McCann, from the creative side of it. From Russia to the ex-communist countries. L.A.: Excellent. So that’s also quite a responsibility, right? Adrian Botan: Yes, I have to scale the model and the success of Romania, which will be a challenge, quite a challenge, but I like challenges. L.A.: What’s the challenge for Southeast Europe today? Adrian Botan: What’s interesting about our part of the world is that we were in the middle of a big social experiment in the last two centuries. And we saw millions of people being forced into communism. We saw how communism destroyed the elite of our nations. And we saw revolutions going on and Russian tanks coming in and stopping them, in ‘53 in Germany, in ’56 in Poland and Hungary, in ’68 in Czechoslovakia, and in the 1980s it was Solidarnosc in Poland and then, in 1989, we saw the fall of the Berlin Wall and the fall of all communist regimes, including the revolution in Romania, which was very brutal and a big shock. So you don’t get to change systems without shock. And even though some of the revolutions in 1989 were peaceful, what happened afterwards was a big struggle. We thought it was easy to rebuild our lives in freedom. In fact it was not. It was very hard. You have to learn how to be free. You have to learn how to compete in a free market. You have to learn all these things – and it takes years. It takes years to build institutions. It takes years to build a class that’s competitive, a creative class. So this is what we went through in the last twenty years. And this marked our revolution. We see it on different degrees in our region, but we are still struggling with this. And, still, there’s the beauty of it because we are building something from scratch and we are evolving in a world that is going for big changes. So I like to say that we went through three big revolutions because we had a communist revolution, then we had the digital revolution, which changed the way people interact, socialize, and also behave as a citizens. And, now, we have a new revolution where capitalism is being put under the question mark. So a lot of things are happening, and for us it’s good, because we are very dynamic, we are societies that are growing and we can be one step ahead if we are faster than the other creatives. L.A.: And all this creativity is leading to the future of Europe? Adrian Botan: The question is whether creativity leads to the future of the European Union? I think we see ourselves as being in the European Union. I think the European Union was a very good idea, but it was not very well executed. Yet that’s the same with any idea. You have to improve it along the way. You have to work on it and adjust it. Every business goes through this phase, every start-up. And we can see Europe as a start-up. And if we see it like this, we can improve it. Nothing is set in stone. So I figure people have to think like this about Europe, not to throw out the baby with the bathwater. And I think it is a big mistake what the eurosceptics are doing right now, trying to say Europe was not a good idea. Europe was for everyone a very good idea, for the Greeks and for the Germans. It manifested itself in a different way, but for the Balkans it was a great idea because it helped us adopt democratic in-stitutions. So it pushed democracy in our country. I think it’s a brilliant idea, but you need to adjust it along the way. L.A.: Will there be a creative renaissance, a renaissance in the Balkans? Adrian Botan: Yeah. I think the Balkans are very creative. And I think the renaissance started with Kusturica‘s movies; they inspired a lot of Romanians. I think we took the ball from ex-Yugoslavia and now we are rolling it. And we are looking over to the next country that will pick up the ball from us – maybe Bulgaria, maybe Turkey. And hopefully the Balkans will become … because it’s a big melting pot of cultures it should be a big melting pot of ideas and creativity. The Balkans are a region with potential. L.A.: They most certainly are! Adrian Botan: I think the growth will be there in the coming years if Europe overcomes the crisis. There will be growth, probably in Greece as well, but Greece is in our region. I hope there will be growth in Greece. It’s a challenge for Europe. 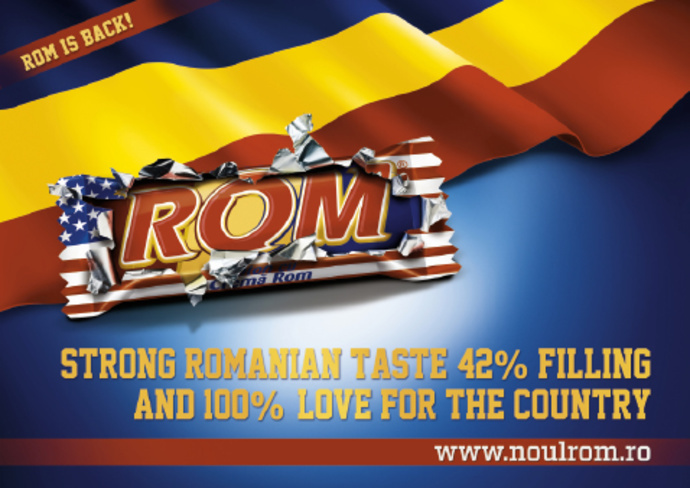 L.A.: Talking about challenges, your “Rom” campaign is a great example of how communication can solve the problem of prejudices against your country, Romania. Could you tell us the story, about how the Rom idea works, and how you came up with it? L.A.: Your “Rom” campaign was also award-ed a Cannes Lion. Maybe you can tell us a bit about people’s reactions and how it went all crazy. Adrian Botan: We were very successful. First, the campaign created enormous pub-lic outrage. Thousands of people went on the internet and started to ask for the Romanian flag to be brought back. They started a discussion on what it means to be patriotic, what it means to be Romanian. What’s patriotic? Is it to wrap yourself in the national flag and shout, “I’m patriotic!” or is it the content that matters? We think we got the answer through this campaign. L.A.: Then you went on to do a very successful follow-up, changing the Google algorithm about Romania, which also won in Cannes. 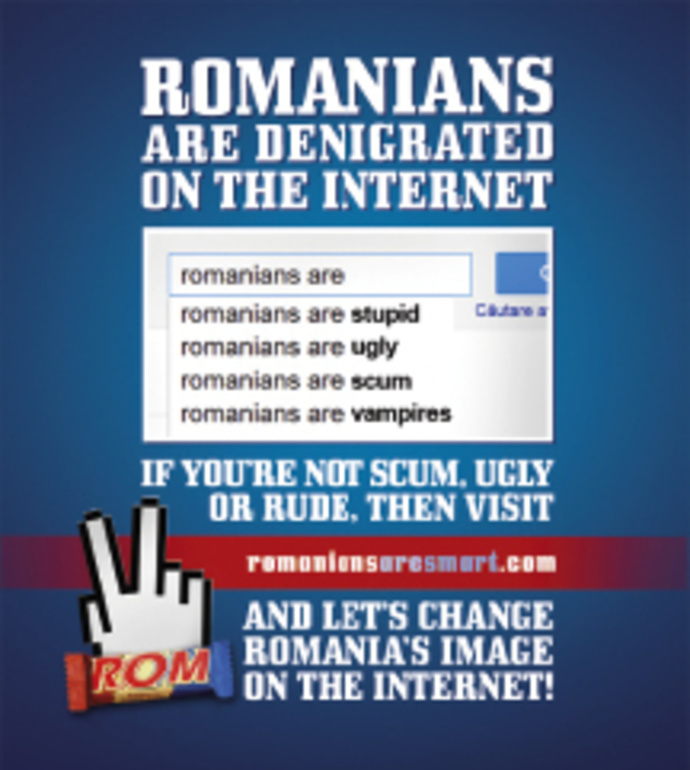 Adrian Botan: The next campaign we did with “Rom” was aimed at changing the image of Romanians over the internet and the perception they have of themselves. So we discovered that, if you go on Google and you type in the word “Romanians,” you would get a very negative search prediction, for instance Romanians are stupid, dumb, vampires, or gypsies. So we created a campaign where we crowdsourced the patriotic outrage and asked people to come and change it. 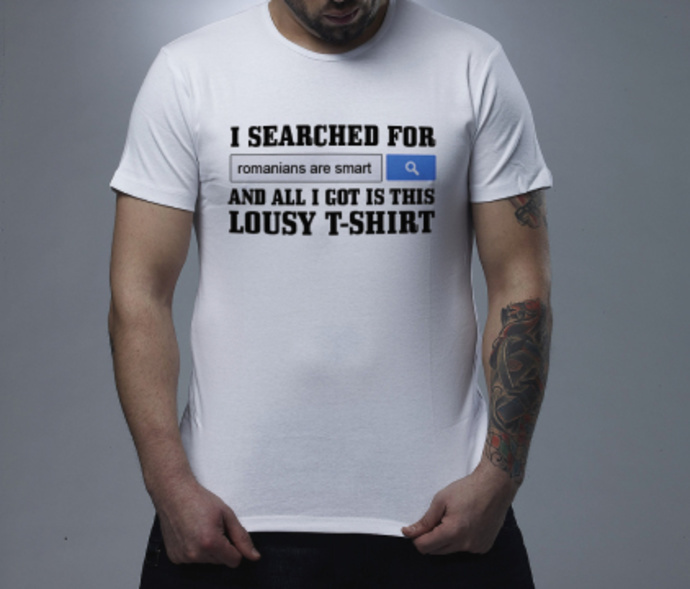 Go on Google, type “Romanians are smart,” and you can change the Google impression about Romania. This was great because it not only changed the Google predictions – it also changed the whole content on the internet about Romania. It also generated a lot of positive conversation, a lot of positive talk about Romania, a lot of positive blog posts, and articles. So the campaign went from an exclusively online campaign to offline media and national television. We had the biggest news channel in Romania organizing an event, a media event on Romanian National Day, in order to help us change the predictions in Google. And so we also started to change the narrative in the media about Romanians. I think that was the most important thing because it is changing the image that Romanians have of themselves. So I think that, now, this work has to continue because it doesn’t stop with a one-month campaign. I think what happened is that Tom Burrell saw our campaign at your festival and was impressed by how we can change not only the perception foreigners have about Romanians but the perception Romanians have of themselves. Because I think this was key in the campaign. So he thinks that this is also relevant for the African-American population in the States. It’s a lot about this negative perception, the barrier you have in your head, that drags you down and keeps you from progressing. So we met at Berlin School of Creative Leadership to discuss how we can advance this idea and how we can make it relevant for other groups that have to suffer from an inferiority complex, and it’s an ongoing task. L.A.: How important is digital advertising today? Adrian Botan: We didn’t have something specific that’s actionable and that’s easy to change. But Google predictions … it’s global, you can change it, you know. To change the whole media story about Romania, that’s a much bigger task. But you need to have a start and we had a start. So that was very important – that we had something very specific to start from. And then, yes, you can address the bigger media story and go into really complex storytelling. I feel it is very interesting when you think about the web. It didn’t exist thirty years ago. We are simply not prepared for this world and that’s the beauty of it – compared to advertising in the Eighties or in the early Nineties – that, every day, you learn something that you didn’t know. And you discover by doing – not only by reading but by doing things. And this is what happened to us during the campaigns for “Rom”. For example, we discovered a total-ly new way of working, a totally new process. We discovered that we transform from a traditional agency to an agency that does social media management and PR and we started to act more like a newsroom than an agency. So for the last two “Rom” campaigns, for example, we had daily meetings, where the whole team would come together, a multidisciplinary team with digital people, with PR people, with traditional storytelling people, and with media people. We analyzed what happened in the media yesterday, and what our reaction today should be. And we came up with lots of new ideas that fit the campaign or managed/directed the conversation. I think what we are doing now, it’s a lot about managing a life narrative, you know. A media narrative that’s so complex it’s everywhere. It’s not one thing that you have to manage. You have to manage social media, you have to manage traditional media, and you have a conversation with all of these factors. You have to manage angry consumers, you have to manage passionate consumers, advocates, and the detractors as well, as was the case in “American Rom.” You have to manage even the employees, for example, in “American Rom.” Actually, that’s an inside story: in the “American Rom“ campaign, we had a brief midway through the campaign that was not foreseeable before the campaign. Employees were going against their management: “What are you doing? Are you going to change the flake on our chocolate?” People in the factory wanted to kick out the marketing guys, so we had to handle this as well. We therefore had an internal crisis and had to manage the internal PR. What’s the story you are telling them, you know. So it was all about managing a very complex story and, for me, it’s the closest to what‘s happening in big election campaigns. How do you make sure that you don’t lose control of your story? And ensure you don’t get into territories that you don’t want to get into. It is, in other words, fascinating that we are here at this moment, doing this; it was not foreseeable. L.A.: What is the Romanian identity? Adrian Botan: The Romanian identity … that’s a good question. I think we see ourselves as being somehow heroes of history because, in this part of Europe, we are between empires. We have always been between Turks and Western Christianity, between Russia and the South of Europe. So being in this place – it‘s not a good place to develop but a good place to have good fighters. So the Romanians are good fighters. L.A.: You know what Slavoj Zizek said about Romanians? Because everybody only knows of Romania thanks to Dracula, he said that the Romanians should happily accept that they are all vampires. Adrian Botan: Yeah, we had some problems in accepting these vampire stories as an identity. But I think what‘s most important is we are seeing ourselves as a Latin island in the middle of a Slavic ocean. And that’s very important because that’s how we define ourselves. We are much more outgoing than our neighbors, very sociable, very pleasant people in Romania – and very smart as well. L.A.: Zizek said that the Bulgarians should accept that they are good umbrella makers because they invented the “Bulgarian umbrella,” which shot out a pellet containing poisonous ricin (he meant it ironically, of course). Then he talked about Romanians, the prejudice being Dracula, and he said, “Go and just take it!” because it’s an image for Romania. Adrian Botan: We tried to build on the Dracula cliché, but the thing is that Roma-nians don’t embrace it easily; it’s too commercialized. And every time we work for a different brand, we always ask ourselves: “What’s beyond that cliché?” because it is very easy to take a cliché and to play with it. But what’s beyond it, what’s unique in Romania? Maybe that’s the self-irony, the self-deprecating humor, which is a bit in between English humor and Israeli humor. We have very good connections with Israel, for example. Whenever we go there, we find a lot of people that come from Romania. So we feel very at home there. And then you go to England and you have a sense of irony and self-deprecation. So, I think that’s what’s special about Romania: we know how to laugh at ourselves, and we are always ready to do this on a global scale. So that’s our identity. L.A.: What is specific about the creativity of the Balkans? Is there a Balkan spirit of creativity? Adrian Botan: I think the root of Balkan creativity is the class of culture that we have here. We are at the meeting point between oriental culture and western culture. We get our inspiration from that and there’s a lot of imitation, bad imitation, better imi-tation, but it’s always like this: we are try-ing to adapt western artifacts to the Romanian, to the “Balkanic,” if you like, background, cultural background. And, out of this, comes always a surprising image, or a surprising visual, or a surprising new artifact. And what I think is interesting is you just have to show the reality, because it’s so amazing. You don’t have to make anything up. L.A.: That’s interesting. It’s like what Helmut Newton, the famous photographer, once said to me: “You can’t beat real life for be-ing bizarre.” Is that what a kind of Balkan creativity might be? Adrian Botan: Yes, I think that real life is al-ways better than the contrived artifact, the contrived idea. We had a very successful campaign a couple of years ago for MTV. It was just showing the way people are adapting MTV and the pop culture, western pop culture, to Romania. And it’s very much what Kusturica does in his movies: it’s like all this mixed up together with the natural things of western culture and gypsy culture, and Serbian and Romanian … and it’s a huge melting pot. L.A.: And I think one of the ingredients is passion. The philosopher Hegel once said, “Nothing in the history of mankind was ever accomplished without passion.” How important is the passion? Adrian Botan: I really believe in passion, especially in advertising, because you have to believe in what you do. You see so many people doing things just because this is the way it is done, but I think the most successful ones are those that believe in what they do and do it with passion. So passion is the main ingredient. But what’s interesting is that we use passion in a different way than, for example, the English use it. It’s black and tears, and so it’s for real; we might get into a fight later, or love. L.A.: Let’s talk about Vodafone. Could you elaborate on your creative output for Vodafone? Adrian Botan: We always do great work for Vodafone. We took a bunch of actors and recreated a gang of friends that are very, very Romanian. So, for the first time, we are doing a reality show commercial. We took the life of a Romanian rap star and made a show about it … and all the commercial, his life on Facebook … it’s all about his life: He is having a new baby, he is getting married … And he is very Romanian, very real, and, like, it’s real life. L.A.: Is there a certain approach to storytelling in Romania? 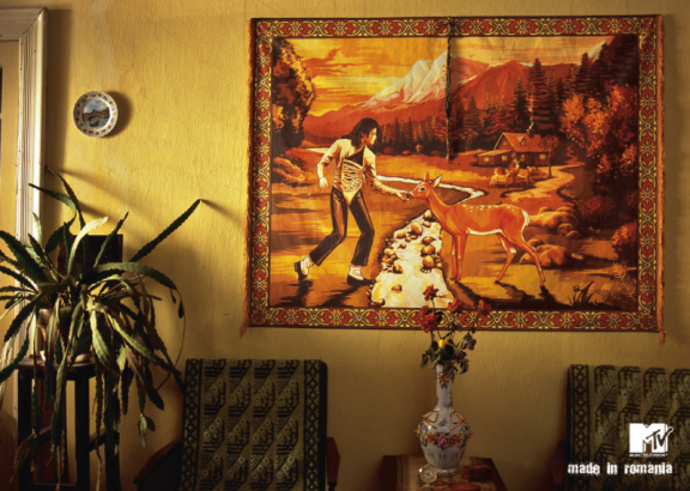 Adrian Botan: I think Romanians have a natural talent to tell stories and to entertain the viewer. They love to do that, they love to take you on a trip. They will tell you tons of stories about Romania, they will tell you about our history and about their versions. I think it’s important that we have this storytelling DNA – and it’s a good basis for the start of creativity, Romanian creativity. L.A.: How do you make stuff that gets noticed? How do you rock the boat? Adrian Botan: I think a lot of it is about lateral thinking, because with a traditional, straightforward approach you cannot tackle the problems that are so deep, perceptions that are so deeply ingrained in people’s minds that they take them for granted. You need something that shakes things up.